Today, like all days, we admire and honor our veterans. We thank you for your service and your continued support of Americans everywhere.In honor of Veterans Day, we had thepleasureof speaking with not only a loyal BraunAbility customer, but a former soldierwho dedicateshis time and talents to the PVA to aid vets all over the United States. Here is his story. 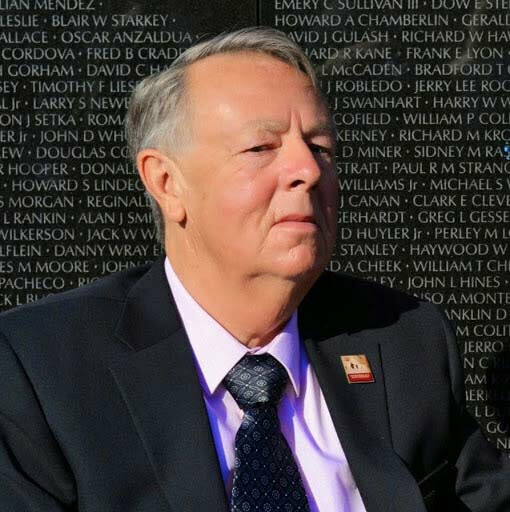 Larry Dodson served in the Air Force between 1966 and 1970 during the Vietnam War, where he saw many American sacrifices. However, back home, mainstream media presented the war as morally wrong and the soldiers as evildoers, making the welcome back to the States anything but. "Vietnam vets were cursed, spat upon, run down," Dodson said. "(Veterans) were encouraged to take our uniforms off and put on civilian clothes to re-enter the public." Then, in 1974, Dodson found himself in a hospital bed in California - paralyzed, unable to breathe on his own, able only to blink. "I was walking and slipped and fell on some oil and water on the floor. It was nothing traumatic, nothing glamorous." This simple accident left Dodson with a C-4 fracture ofhis spinal cord and an estimated five years to live. Having escaped the war only to be rendered helpless in the hospital by a simple slip in his home, Dodson felt cheated. At 26 years old, he had his whole life ahead of him reduced to just five years. It was a low point only remedied by the support of his parents and his friends. Over the course of the next nine-and-a-half months in the hospital and through what Dodson calls his "dog-headed determination," he gradually regained feeling in his upper body and was given a wheelchair to begin to regain his mobility. His relationship with the chair wasn't all too favorable, at first. "Back then, the chairs were especially heavy," he said. "They were made of stainless steel, so they were difficult to push." After getting out of the hospital, the president of the company Dodson previously worked for called and offered him another job. He flew back to North Carolina to start work and spent 10 years there before starting his own accounting business and opening 14 offices in North and South Carolina. While in North Carolina, he discovered a company called Ilderton Conversion Co., which was selling full-size van conversions from BraunAbility. Hungry for more freedom, Dodson purchased one. "Getting that freedom of transportation was invaluable," he said. This independence was such a rewarding feeling that he stayed loyal to the company and is now on his sixth BraunAbility van. The van gives him and others like him decreased health risks, increased overall well-being and the opportunity to participate in society and their own lives again. With the van making travel, Dodson embracedhis chair and began to compete in wheelchair sports. He became an almost-instant success, setting five U.S.records in track - one of which is still standing - and started to get into marathon races. While competing in Virginia, he met a man who asked which VA hospital Dodson went to. Dodson replied that he couldn't go to a VA hospital because he was injured at home and not while he was in the service. The man told him he was still eligible for treatment and care there. For 20 years, Dodson didn't know he could take advantage of his VA benefits. After switchinghis care provider, he was relieved of some of his financial burdens. 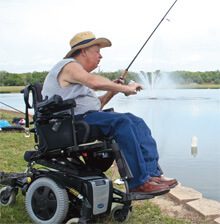 Eventually,competition wore out his shoulders and required surgery.His doctor said continuing to use a manual wheelchair would make him unable to continue to do transfers, so he switchedto a power chair, even though it meant leaving the sport he loved.Heresigned himself to riflery and fishing. A champion once again, Dodson wonthree gold medals in riflery and was Grand National Champion on the bass trail several times. In 1999, Dodson retired from his accounting business and went to work for the Paralyzed Veterans of America. He spent many years as chair of the hospital committee, vice president and, for the last four years, national secretary. Growing up in Oklahoma, Dodson said, there were often serious storms. After each one, people would get into their cars and make sure their neighbors were okay. If their neighborsneeded help removing debris, they did it. "Families help families," Dodson said. He was raised believing in this sentiment, which he brought to his work with the PVA. "You find people that are so discouraged, so downtrodden. My heart goes out to them because I was there," Dodson said. "I can say, 'Listen, I've been down this path and I can tell you there's a lot out there and you can be led.'" At the hospital, Dodson wrote letters for vets, read to them, and educated them on the benefits available to them so no one would have to miss out, like he did, on care reserved for them. 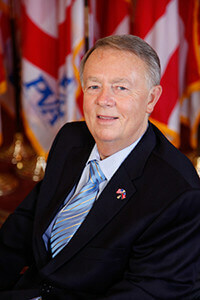 Dodson maintains, "It was an honor and a privilege to serve" in the U.S. Armed Forces. Military service was as rewarding to him as the work he does now with the PVA. "Our pledge in the Army was to 'Honor, Protect and Serve,' and in the PVA, that means honoring the men and woman who gave their lives to defend their country, protecting their rights and serving them to the best of our ability," Dodson said. While things have definitely improved for veterans since Dodson came back to the United States in 1970, the care given to them has a long way to go, he said. "Very few of our elected leaders are veterans or have family who are veterans. We hit a lot of walls." But, never one to accept defeat, Dodson insists he is dedicated to the PVA and anything he can do to improve the lives of his veteran family. "As long as I can, I will help."